Highly efficient in expressing breast milk. Simple button operation and clear LCD screen to display pumping state. Easy to assemble & clean. Choose from single or double-pumping. Choice of Stimulation or Expression modes. Control suction and speed to suit your comfort level with a total of 28 pumping state options. Piston Pump System imitates baby's sucking rhythm. Comfortable & painless while pumping. Includes two soft silicone cushion breast cups. 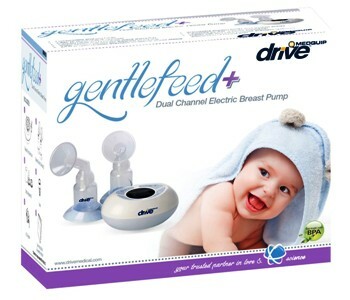 Includes bottle feeding adapter kit &storage containers with lids. May be powered with four AA Alkaline batteries or the included A/C power supply. 16.63" x 10.94" x 18.62"